Are you wondering what books can help you accelerate your travel writing career into new markets and help you build important contacts in the industry? Are you ready to boost your travel writing career to the next level? My Advanced Travel Writer's Pack of reference guides is the perfect way to take your travel writing career up a few notches. For a limited time you can purchase both for $79. That's 10% off when you buy both of these books together. 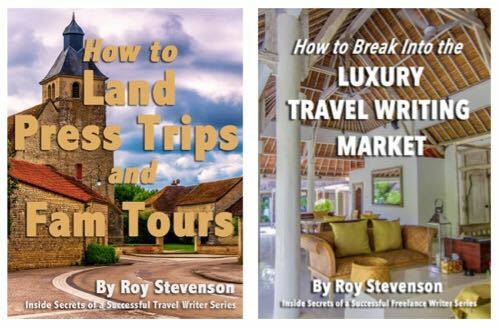 How To Break Into The Luxury Travel Writing Market will put you on the fast track to writing for the luxury travel market. You’ll break into this market faster because you will know learn the techniques to do it right. This 130-page guide also includes a solid list of 55 print magazines and 21 travel websites that publish luxury articles. Having this list of sales leads at your fingertips will save you time and help get your story ideas out to editors quickly. This guide is full of step-by-step advice, sample request letters, sample query letters, valuable resources to how to use your assignments to get invited on press trips, and much more. How To Land Press Trips And Fam Tours will show you how to use your travel writing skills and credentials to request free or discounted travel, meals, tours, accommodations, and entry into museums and tourist attractions. Whether you’re just starting out in travel writing or have some experience, if you want to land more press trips, you’ll find valuable resources to help you in this comprehensive 75-page guide.